Five of the Reds’ summer signings featured. Danny Ings looked hungry on his Liverpool debut. A HOST OF Liverpool’s new signings got their first opportunity to impress manager Brendan Rodgers this afternoon as the Reds began their pre-season tour of the Far East and Australia with a 4-0 win. Lazar Markovic, Mamadou Sakho, Adam Lallana and Divock Origi were all on the scoresheet as the Premier League club eased to victory against the Thailand All-Stars in Bangkok. Rodgers fielded two separates sides for the opening game of their tour with Adam Bogdan, Joe Gomez and Danny Ings all handed starts and Nathaniel Clyne, James Milner and Origi then introduced at the interval. Brazilian Roberto Firmino is still on holidays after his involvement in the Copa America. It was a comfortable run-out for Liverpool as their preparations for the new season intensified in torrential ran at the Rajamangala stadium. It took the tourists just three minutes to break the deadlock with Joao Carlos Teixeira picking out Markovic to round the advancing goalkeeper and slot home. Teixeira impressed throughout and provided the assist for the second goal as his corner was headed past Walut Makemusik by the unmarked Sakho minutes before the break. Ings thought he had opened his Liverpool account before he made way but the referee had already blown after Sakho had committed a foul in the build-up. Rodgers rung the changes at half-time but it did little to affect the pattern of the game as Liverpool continued to put on an exhibition for the 50,000 fans. Jordan Henderson, on his first official outing as club captain, provided the highlight of the evening as his delightful flick teed-up Adam Lallana to make it 3-0 and Origi sealed the win in the closing moments. The squad will now leave Bangkok to head to Australia where they face Brisbane Roar on Friday and Adelaide United on Monday. 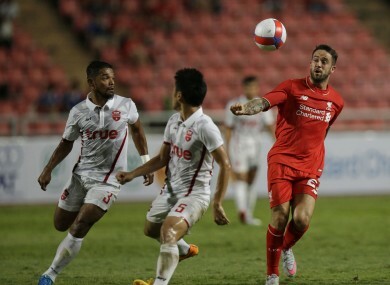 Email “Henderson's rabona assist the highlight of Liverpool's pre-season win in Thailand ”. Feedback on “Henderson's rabona assist the highlight of Liverpool's pre-season win in Thailand ”.